Extra post today, I thought I'd just quickly show off my very recent additions. Pay day is always the most dangerous day of the month! YSL Rouge Pur Couture 52 in Rouge Rose/Rosy Coral: I got round to watching the Lisa Eldridge video on her Korean haul and Beauty look, and remember her talking about the lipstick that got sold out after featuring in a Kdrama. Oddly enough, my phone then presented me with an article by Shameless Fripperies about said lipstick, and after reading that, I went straight to Google it. An image search brought up the Kdrama in question (Man from the Stars, I may very well have to watch it because the styling looks great, even if I'm not the biggest Kdrama fan) as well as an image of a similar gloss. In less than five minutes after that I had it ordered from Boots for next day store collection. I have since read the actress never actually wore this shade, but meh, it's a gorgeous colour which I've already featured in my April favourites despite being less than a week old in my makeup stash. It's bright, bold and really perks your complexion (and mood) up. YSL Gloss Volupte in No. 203 Corail Gandoura: I also got this as a result of the above Google image search. When I got onto the Boots website, I had only intended to get the lipstick but then I saw that there was a 1000 bonus point offer when you buy two YSL products, and that was that. I haven't had a chance to try this out all that much because I've been wearing the lipstick instead, so I'll report back my thoughts on this later. 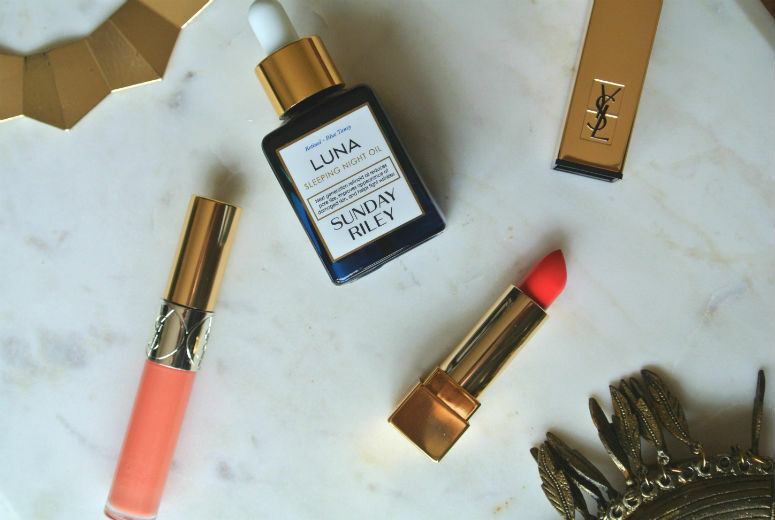 Sunday Riley Luna Sleeping Night Oil: I expect if you read Caroline Hirons at all, you will have seen her post on this earlier this year and been waiting in anticipation for it to hit the shelves. Well it's done so recently, and the same day I popped into Space NK to buy it, it's featured a few times on my Instagram feed. I've used it a few times already, and initial impressions are good, but I'm going to give this a few more weeks before I give my full thoughts. So these are my recent purchases. I'm hoping to keep my spending for the next few months to a minimum with just these and a few Korean beauty purchases, because I want to buy some new fitness gear (obsession after beauty) and have to pay for a trip to Amsterdam in June. Have you guys bought anything new for your stash?